Paul Scharner scored an invaluable West Brom winner as the Baggies twice came from behind to beat Sunderland. The home side took the lead in the 10th minute when Nicky Shorey headed into his own net before Peter Odemwingie tapped in a leveller. Phil Bardsley's superb rising drive ensured Sunderland led at half-time but Youssouf Mulumbu poked home West Brom's second equaliser in the 54th minute. Scharner secured all three points for the visitors with a well-taken winner. Steve Bruce's side went into this game on the back of a dismal run from which they had picked up just one point from their last seven matches, and desperately needed to arrest their slide down the table. But any immediate fears were allayed when Asamoah Gyan's whipped cross from the left forced Shorey to head beyond his own goalkeeper, under pressure from Ahmed Elmohamady. That was Sunderland's first goal since 12 February and Gyan, the architect of the strike, was inches away from doubling their lead a minute later. The Ghana striker controlled Elmohamady's cross from the right with his back to goal, before swivelling and volleying, only to find the side-netting. It was a brilliant improvised effort, but Sunderland's dominance was short-lived as West Brom, still unbeaten under manager Roy Hodgson, levelled in the 28th minute through the impressive Odemwingie. Jerome Thomas's cross from the left looped into the air off Nedum Onuoha, allowing Jonas Olsson the space to head into the path of Odemwingie, who pounced in the six-yard area, sliding the ball home for the equaliser. Odemwingie, who scored the only goal when these two sides met back in August, was a menace throughout and his intelligent runs proved difficult for Sunderland - hit by an early injury to John Mensah - to handle. But Bardsley ensured that West Brom were on level terms for only two minutes and 25 seconds with a thunderous effort from 25 yards. Sunderland won a free-kick that Kieran Richardson rolled into the path of the full-back, who didn't break stride as he thumped a rising shot into the top corner, raising the roof at the Stadium of Light. But rather than build on their advantage Sunderland allowed Chris Brunt, who tested Simon Mignolet with several low drives from the edge of the Sunderland penalty area, to exert his influence on the game. West Brom's second equaliser came from the unlikely source of Mulumbu, who finished a patient move by the Baggies. The midfielder, collecting the ball some 25 yards out, drove forward and exchanged passes with Odemwingie, before poking the ball beneath Mignolet to silence the home fans again. That goal lifted West Brom, who sensed Sunderland's frailty at the back and became the more adventurous as the game went on, taking full advantage of the home side's apparent willingness to sit back. Brunt's delivery was a thorn in Sunderland's side and his devilish delivery from a free-kick found Olsson, whose header drew a superb reflex save from Mignolet to keep Sunderland level. 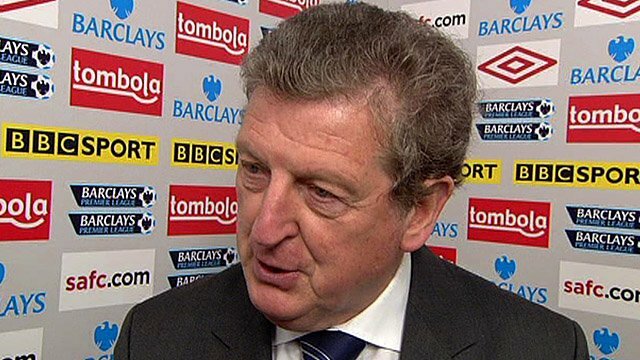 But they were unable to deny a West Brom side that are oozing confidence under Hodgson. Steven Reid's pass picked out the run of Odemwingie and he pulled his cross back to Scharner, who was perfectly placed to sweep home the winner 18 minutes from time. 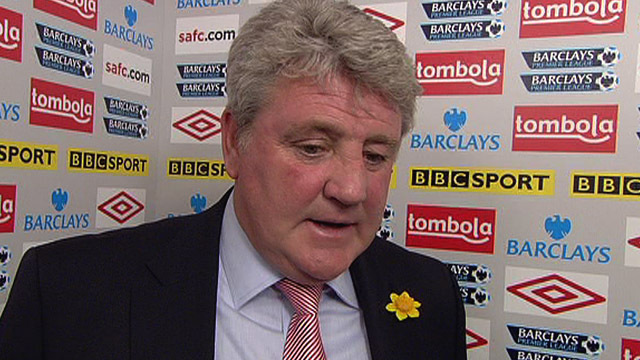 The win boosts West Brom in their quest for survival, but condemns Bruce's side to an alarming seventh defeat in eight. "We had a horrible 20 or 25 minutes and, defensively, we were all over the place. That was where our strength lay this season but now we are having to score too many goals to win a match. "But we've had a disastrous run and it is up to us to get ourselves out of it." "It was a huge victory at this stage of the season against a team like Sunderland who have been wounded in recent weeks, and you know are going to be desperate to take points from you. "We stuck to our task very well and deserved the victory and gives us some breathing space ahead of the bottom three. "I thought we played well, defended well, and the link-up play between midfield and attack was very good." 90:00+5:46 The final whistle is blown by the referee. 90:00+3:30 Gabriel Tamas concedes a free kick for a foul on Phillip Bardsley. Phillip Bardsley takes the free kick. 90:00+3:30 Booking Caution for Gabriel Tamas. 90:00+2:09 Shot on goal by Danny Welbeck from just inside the area goes over the target. 90:00+1:14 Substitution (West Brom) makes a substitution, with Gabriel Tamas coming on for Peter Odemwingie. 90:00+0:03 Steed Malbranque is ruled offside. Scott Carson takes the indirect free kick. 86:00 Abdoulaye Meite gives away a free kick for an unfair challenge on Asamoah Gyan. The ball is sent over by Steed Malbranque, Danny Welbeck takes a shot. Peter Odemwingie gets a block in. Steed Malbranque takes the inswinging corner, clearance made by Abdoulaye Meite. Corner from the left by-line taken by Steed Malbranque, save by Scott Carson. 84:50 Substitution Marc-Antoine Fortune replaces Simon Cox. 80:15 A cross is delivered by Steed Malbranque, Header by Asamoah Gyan from deep inside the penalty area misses to the left of the goal. 79:40 Lee Cattermole fouled by Youssouf Mulumbu, the ref awards a free kick. Boudewijn Zenden takes the free kick. 79:11 Free kick awarded for an unfair challenge on Phillip Bardsley by Jerome Thomas. Direct free kick taken by Boudewijn Zenden. 77:13 Free kick awarded for a foul by Steven Reid on Steed Malbranque. The free kick is delivered left-footed by Boudewijn Zenden from left wing, Simon Cox makes a clearance. Inswinging corner taken by Steed Malbranque, Abdoulaye Meite manages to make a clearance. 77:13 Substitution Stephane Sessegnon joins the action as a substitute, replacing Anton Ferdinand. 77:13 Substitution James Morrison replaces Chris Brunt. 76:03 Shot from outside the box by Peter Odemwingie misses to the left of the goal. 75:28 Simon Cox takes a shot. Simon Mignolet makes a save. 72:42 Jerome Thomas challenges Nedum Onuoha unfairly and gives away a free kick. Nedum Onuoha takes the direct free kick. 71:42 Assist on the goal came from Peter Odemwingie. 71:42 GOAL - Paul Scharner:Sunderland 2 - 3 West Brom Paul Scharner finds the back of the net with a goal from inside the box to the bottom right corner of the goal. Sunderland 2-3 West Brom. 69:47 The assistant referee flags for offside against Peter Odemwingie. Free kick taken by Simon Mignolet. 68:11 Foul by Anton Ferdinand on Paul Scharner, free kick awarded. Chris Brunt delivers the ball, Jonas Olsson takes a shot. Save by Simon Mignolet. Outswinging corner taken left-footed by Chris Brunt played to the near post, clearance by Nedum Onuoha. 68:11 Booking Anton Ferdinand goes into the referee's book for unsporting behaviour. 67:43 The ball is delivered by Steed Malbranque. 64:29 Free kick awarded for an unfair challenge on Jerome Thomas by Nedum Onuoha. Free kick crossed left-footed by Chris Brunt from left channel. The offside flag is raised against Peter Odemwingie. Indirect free kick taken by Simon Mignolet. 61:20 Effort on goal by Chris Brunt from outside the penalty box goes harmlessly over the bar. 60:52 Nedum Onuoha takes a shot. Jonas Olsson gets a block in. 55:13 Peter Odemwingie takes a shot. Simon Mignolet makes a save. 53:50 Peter Odemwingie provided the assist for the goal. 53:50 GOAL - Youssouf Mulumbu:Sunderland 2 - 2 West Brom A goal is scored by Youssouf Mulumbu from deep inside the penalty area to the bottom left corner of the goal. Sunderland 2-2 West Brom. 51:04 Foul by Steven Reid on Steed Malbranque, free kick awarded. Phillip Bardsley delivers the ball from the free kick right-footed from left wing. 50:15 Chris Brunt takes a shot. Save made by Simon Mignolet. 50:00 Unfair challenge on Steven Reid by Steed Malbranque results in a free kick. Direct free kick taken by Youssouf Mulumbu. 49:02 Danny Welbeck gives away a free kick for an unfair challenge on Abdoulaye Meite. The free kick is swung in left-footed by Chris Brunt, Simon Mignolet makes a save. 46:47 Nedum Onuoha gives away a free kick for an unfair challenge on Simon Cox. Direct free kick taken by Jonas Olsson. 46:00 Steed Malbranque takes the inswinging corner, Lee Cattermole takes a shot. Blocked by Jonas Olsson. 45:01 Substitution Boudewijn Zenden replaces Kieran Richardson. 45:00+4:41 The ref blows to signal half-time. 45:00+4:17 Foul by Lee Cattermole on Steven Reid, free kick awarded. Abdoulaye Meite takes the direct free kick. 45:00+4:17 Booking Booking for Lee Cattermole. 45:00+0:28 Lee Cattermole challenges Youssouf Mulumbu unfairly and gives away a free kick. Chris Brunt fires a strike on goal direct from the free kick, Simon Mignolet makes a save. 43:07 Free kick awarded for an unfair challenge on Lee Cattermole by Paul Scharner. Direct free kick taken by Michael Turner. 40:18 Ahmed Elmohamady fouled by Nicky Shorey, the ref awards a free kick. Nedum Onuoha restarts play with the free kick. 38:58 The referee blows for offside against Peter Odemwingie. Simon Mignolet takes the indirect free kick. 37:48 Outswinging corner taken from the left by-line by Chris Brunt. 30:25 Unfair challenge on Asamoah Gyan by Abdoulaye Meite results in a free kick. The assist for the goal came from Kieran Richardson. 30:25 GOAL - Phillip Bardsley:Sunderland 2 - 1 West Brom Phillip Bardsley gets on the score sheet with a goal from long distance to the top left corner of the goal. Sunderland 2-1 West Brom. 28:00 Assist on the goal came from Jonas Olsson. 28:00 GOAL - Peter Odemwingie:Sunderland 1 - 1 West Brom Peter Odemwingie gets on the score sheet with a goal from close in to the bottom left corner of the goal. Sunderland 1-1 West Brom. 27:27 Youssouf Mulumbu fouled by Asamoah Gyan, the ref awards a free kick. Chris Brunt takes the free kick. Correction - 26:15 Foul by Simon Cox on Kieran Richardson, free kick awarded. Steed Malbranque delivers the ball from the free kick right-footed from left channel. 26:15 Free kick awarded for an unfair challenge on Kieran Richardson by Simon Cox. Steed Malbranque delivers the ball from the free kick right-footed from left channel. 24:40 Nicky Shorey is penalised for handball and concedes a free kick. Kieran Richardson restarts play with the free kick. 24:40 Booking Kieran Richardson booked. Correction - 21:22 A cross is delivered by Phillip Bardsley. Steed Malbranque delivers a pass corner to short, Youssouf Mulumbu makes a clearance. 21:22 Phillip Bardsley produces a cross. Corner crossed in by Steed Malbranque, Youssouf Mulumbu manages to make a clearance. 16:48 Free kick awarded for a foul by Kieran Richardson on Simon Cox. Jonas Olsson takes the free kick. 15:27 The ball is sent over by Nicky Shorey. 14:44 Foul by Ahmed Elmohamady on Paul Scharner, free kick awarded. Free kick taken by Jonas Olsson. 12:45 Ahmed Elmohamady delivers the ball, Effort from inside the area by Asamoah Gyan misses to the right of the goal. 11:13 Substitution (Sunderland) makes a substitution, with Anton Ferdinand coming on for John Mensah. Correction - 9:44 Asamoah Gyan provided the assist for the goal. 9:44 The assist for the goal came from Asamoah Gyan. 9:44 GOAL - Nicky Shorey:Sunderland 1 - 0 West Brom Own goal by Nicky Shorey. Sunderland 1-0 West Brom. Correction - 9:40 Centre by Asamoah Gyan. 8:28 The ball is delivered by Phillip Bardsley. 5:34 Effort on goal by Simon Cox from just inside the penalty area goes harmlessly over the target. 2:16 Shot from outside the penalty box by Paul Scharner goes wide right of the goal.